Hey hey! So you may remember that Sandra and I have a little tradition with our friend An, where we buy each other a degustation dinner as a birthday gift. 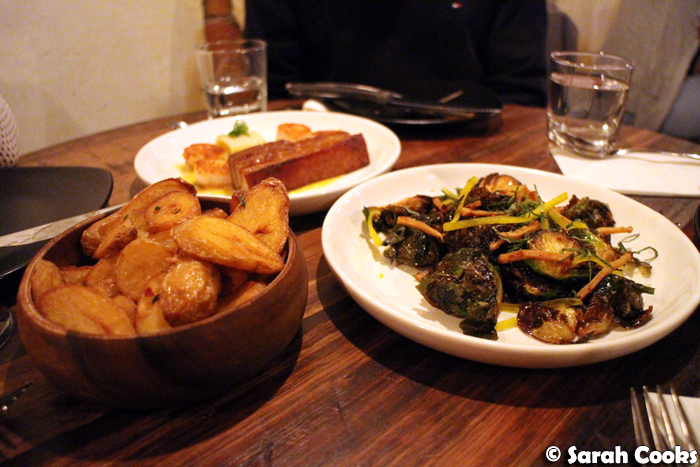 (There's been Stefano's, Vue de Monde, and Tetsuya's, to name a few). This year, I asked An if we could dial it back a little, as the dinners were getting more and more extravagant, and we've been trying to spend a bit less. Perhaps something around the $50 a head mark, rather than $250. An was definitely agreeable, and I was thrilled when he said we'd be going to The Noble Experiment this year as a joint birthday gift for Sandra, myself, and our good friend Adri. It had been on my wishlist for ages - tasty food and fun cocktails, yes please! 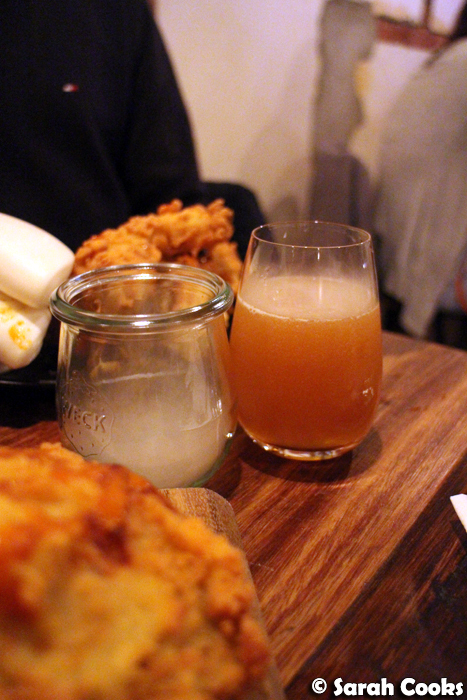 The Noble Experiment is a cool, relaxed restaurant and cocktail bar on Smith street. The menu is full of fun, on-trend dishes with a mix of influences - think bao buns, slow cooked meats, cured kingfish, fried chicken and more! Unsurprisingly, they have an extensive cocktail list - and a lot of the food is excellent for drinking. Our waitress was really great and gave us drink recommendations based on our flavour preferences. 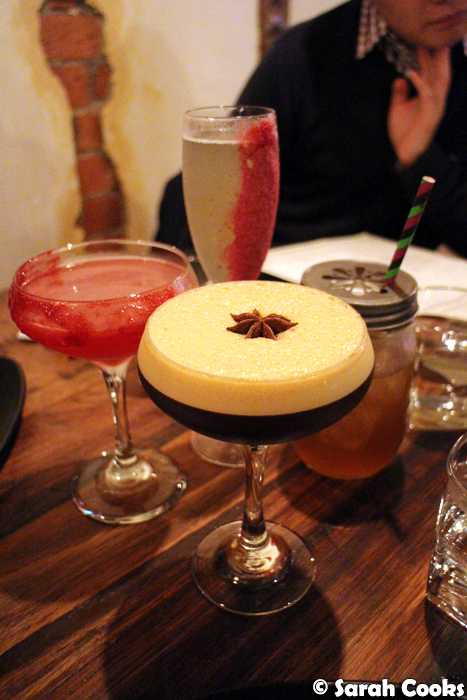 You can see our first round in the photo at the top - mine was the "Outrageously Good Espresso Martini". 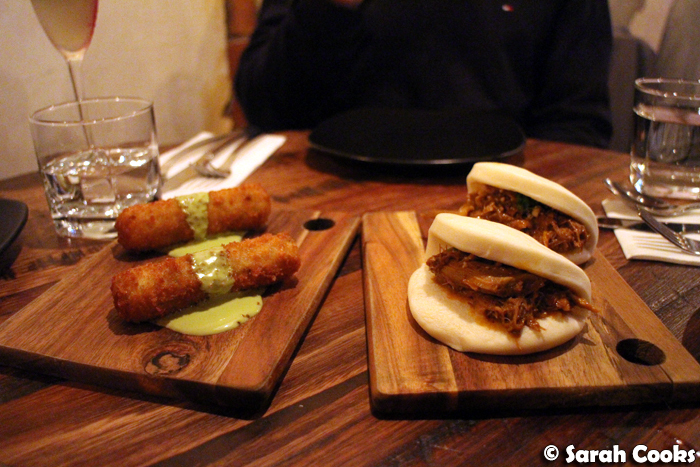 We started with a couple of snacky bites - the super crisp pigs heads croquettes, and the pillowy soft bao buns with tender slow-cooked lamb. Off to a good start. 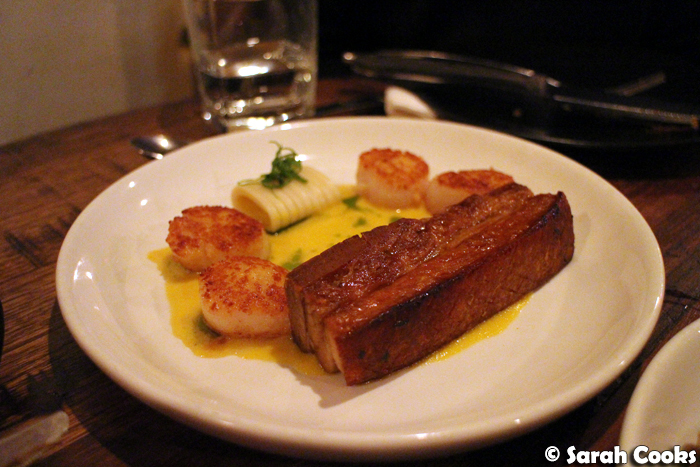 The pork belly was a great dish - a tender slab of flavoursome pork belly (the crackling could have been cracklier), with four perfectly cooked scallops, a pool of corn purée and a small cylinder of house made ramen noodles. Each element was done really well, and they all complimented each other. Our waitress described the roast kipflers as "chips on steroids", and I tend to agree. They were super crispy on the outside, and fluffy on the inside, with an excellent flavour from the confit garlic and thyme. I'm a huge potato fiend, and would have happily had a bowl of these to myself as dinner in its entirety. 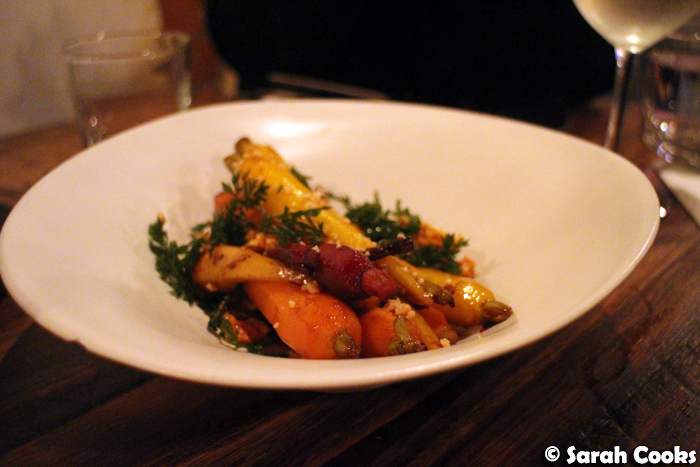 The smoked honey-glazed carrots weren't quite as spectacular as the potatoes or brussels sprouts, but still very good. There was a great mixture of sweet, smoky and fresh flavours, with unexpected pops of crunchy sweetness from crushed honeycomb. (That's the crunchy candy, not honeycomb from a hive). There are a couple of order-ahead options on the menu - fried chicken, lamb shoulder, beef brisket, and pork shoulder - and An decided to go with the crowd-pleasing choice of fried chicken. 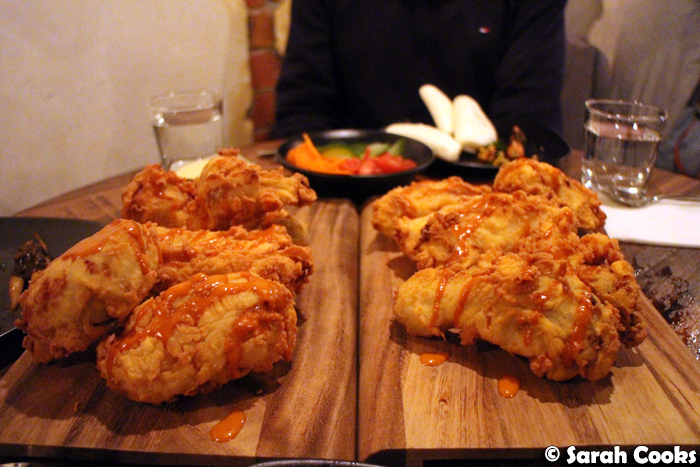 The full fried chicken was a huge portion (they also offer half a chicken! 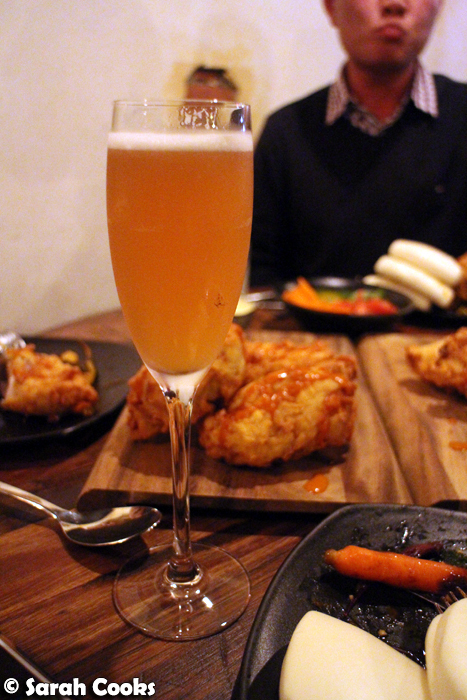 ), served with house-made sriracha, pickles, mayo and bao buns. This looked great but was actually the least impressive dish of the night. The chicken itself was well cooked - super succulent and juicy, with a crisp exterior. Unfortunately it was quite bland, even with the sriracha sauce drizzled over. And the bao buns were kinda awkward with the big pieces of bone-in chicken. We left most of the bao buns and concentrated on the chicken, pickles and mayo. I reckon I'd skip these next time and try something else from the menu. I love sparkling cocktails and citrus flavours, so no surprise that I loved the Sprezzatura Royal. Actually, even though I had this in the middle of the meal, I think it would make a fab aperitif. Will order again. 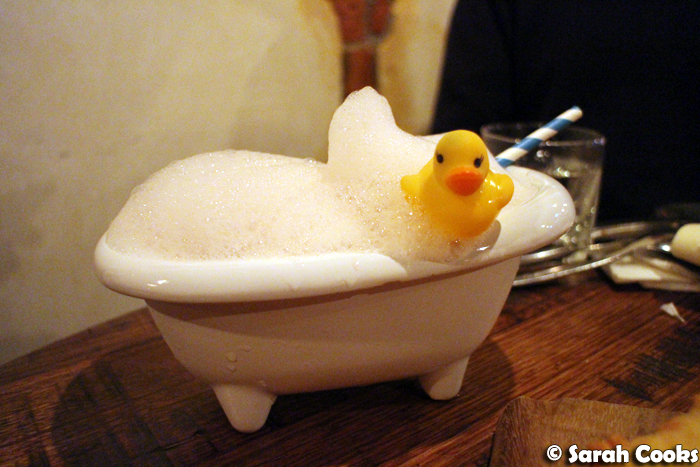 The Bathtub Gin cocktail is a bit of a gimmick, but that can be forgiven when it's so cute! And when it tastes so good! We were pretty full, but had to order dessert - it was a celebration, after all! We shared two desserts between the four of us, which was a good amount. I couldn't go past the beignets (deep fried sweet potato and chocolate donuts, amirite?) 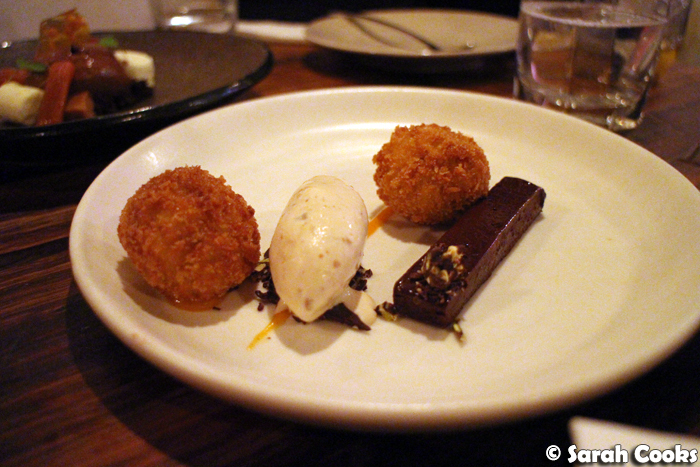 The crunchy balls (heh) were filled with molten chocolate, with an extra chocolatey boost from the chestnut honey ganache. It wasn't listed on the menu, but the quenelle of ice-cream was pecan pie flavoured. Pecan pie! Amaze. The frangelico chocolate mousse was also very good. Against the smooth chocolate mousse and rich coconut cheesecake were tart sticks of poached rhubarb, coffee and caramel ganache, and and crisp almond brittle. 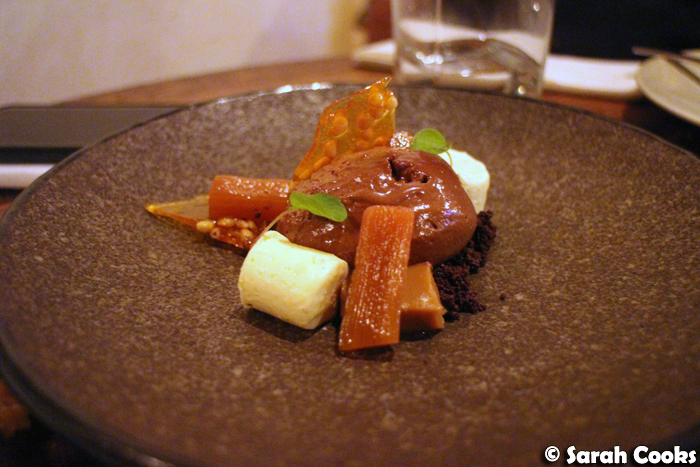 My favourite past of this dish, however, was the chocolate soil - it was really dark and had an intense cocoa richness, totally bringing together all the elements on the plate. So, there were lots of hits, one miss, and lots of excellent cocktails, in a great atmosphere. We had a really good time at The Noble Experiment and I'm definitely keen to visit again! The Noble Experiment is also the name of a rather nice cocktail at EDV. Ahh I thought you were doing an experiment with Noble one or something! I can imagine buying degustations can get pricey. That's great that you can have one for such a reasonable price. Bahaha the bathtub gin is a crack-up. I would definitely be feeling mind-trapped into drinking soap bubbles though!